When we lived in LA, what we loved about the city was that on a given day, we could see a great exhibition at a number of world-class museums; see new work at galleries in a handful of art districts; browse the numerous specialty art, architecture, design-related bookstores; hear a visiting artist speak at any of the umpteen area universities; go to an arthouse theater, or a silent film theater, or a foreign film theater. That gargantuan city has seemingly endless opportunities to expand your horizon as an art and culture lover. But practically, it’s a hard place to make art. 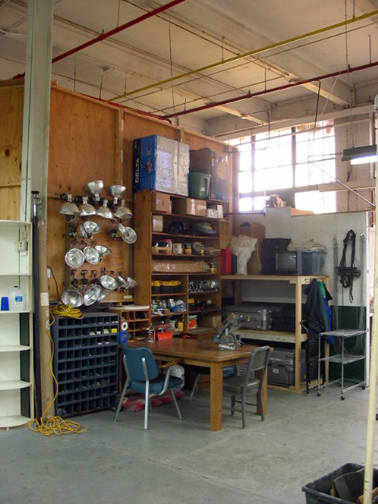 Studio space is scarce, pricey and often limited in size. The cost of living is high. And there’s something about limit-less opportunities that makes it easy to neglect your own work in favor of doing something more appealing. To spend your money on tickets to RedCat instead of artmaking materials. 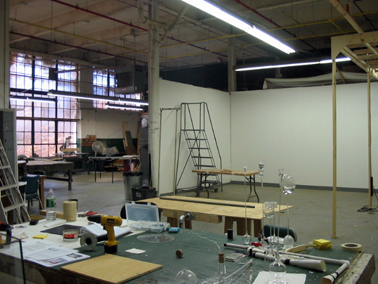 Now that we’ve set up studio in Providence, we’re starting to hear the same complaints from artists who have fled “The City” [this seems to be what East Coasters say in reference to NYC] in favor of this artist-friendly town. Providence has in spades what more notable culture centers don’t: abundant, cheap industrial studio space; low(ish) cost of living; and — most importantly, I think — fewer distractions. At the same time, we’re not geographically isolated from the rest of culture. Murray and I have established an art-viewing routine here that involves going to Boston at least weekly and to New York almost monthly. We travel in this country and abroad often enough to get our fill of new ideas and the current dialogue in the art world at large. But on a daily basis, we have the luxury of time and space in the studio. Good coffee on our way there. 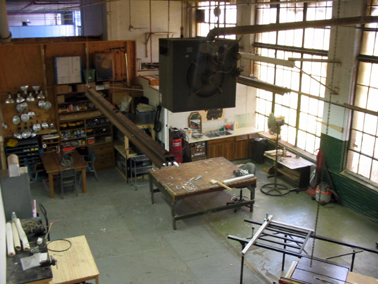 Other artists, industriously working nearby. For us, it amounts to a vibrant, daily practice. And that’s a good trade-off. awesome working space guys !! !